This 335 paged novel is Adi’s first novel. It’s a story dealing with the life of Anu, a vampire hunter from New York who has just shifted to New Delhi, capital of India and its crimes. The reason behind the shift is clear and personal. Her goal is vengeance. The vendetta of avenging her now-dead lover Brian is what she wanted but this leads her to stumble upon a sinister plot, which may wreck the entire city or the entire country, and maybe the entire world. Armed with new friends and new enemies who are her allies, this novel is a small little tale of a strange world which defies all of Anu’s pre-assumed conventions as she discovers a new strategic and tactic method of fighting her foes: Be and let be. 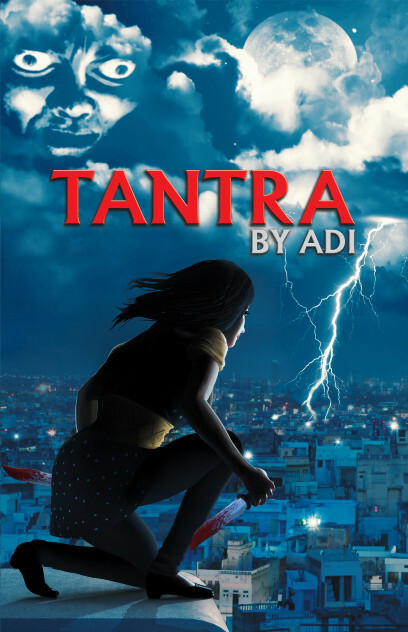 Highlighting the key points of the book that delighted me, Tantra deals with some fine unexplored nuances of Indian fiction like tantric magic, vampires and secret hunting’s. Not that other books haven’t attempted this, but they always failed, unlike Tantra. It wins because it defeats other books in certain aspects which enchant a reader. Tantra has characters which resemble people you may bump into everyday i.e. the characters are believable rather than fantastical imaginary perfect human beings. Also, the setting of the book is as I like it, subtle and subdued rather than over-detailed and explicit. Also another nugget i loved was the entire “shaadi karo beta” underlining in the book which almost every person in India is used to and tolerates in a grudging attitude. The place where the book fails me is the narration. I found the book to be too much of “Chetan Bhagat” style of narration. Yes, the characters were lively and relatable but the plot as well as the storyline was not. I found it hard to believe the instances mentioned in the book as many fine points were just glossed over, rather than being detailed. I re-iterate myself when I say that a book is not damaged by its details but rather by its lack of details. Overall, this book is a decent read with a non-flowery pattern dealing with an interesting topic. A definite recommendation to light readers or newbie readers who want to sink their teeth on something easy before moving on to something more intimidating or the big guns. This entry was posted in Book, Book Review, Magic, Saatvic, Tantra, Tantric, Vampire.